You've heard it before - the way to a man's heart is through his stomach. But an Italian man? Mamma mia, that's another story entirely. Speaking of mom, be nice to his mother and maybe she'll teach you how to make his favorite meal. If not, these Italian recipes should please the discriminating palate of any man - or woman, for that matter. Veal is an important protein in Italian cuisine. This young, tender meat deserves to be treated with kid gloves as it is here, where it's breaded lightly, pan fried, and served with a lemon-caper sauce. The word "piccata" refers to the method of cooking, as opposed to what most people believe means "piquant" because of the lemon sauce. Set up a breading station by whisking together flour, salt, and pepper to taste in a shallow bowl large enough to accommodate the veal cutlets. Place beaten eggs and 1 tablespoon water in a separate shallow bowl large enough to accommodate the cutlets and season with salt and pepper to taste. Place a large skillet over medium heat and add olive oil. Heat to hot (but not smoking) while you bread the cutlets. Dredge the cutlets in the flour, shaking off any excess. Dip cutlets in the egg mixture and immediately place in the hot pan. Reduce the heat if the cutlets are cooking too quickly. Cook cutlets about 2 minutes per side until golden brown. Set cutlets aside on a plate lightly covered with foil. Add white wine to pan to deglaze it. Reduce volume by half and add lemon juice, capers, and 1 tablespoon chopped parsley. Whisk in butter to thicken the sauce. Taste and adjust the seasonings if necessary. Prepare the garnish by sautéeing the pancetta and sliced mushrooms in a separate small skillet until mushrooms are cooked and fat has rendered out. Turn off the heat and add diced tomato, mixing well. Drizzle a platter or individual plates with lemon-caper sauce. 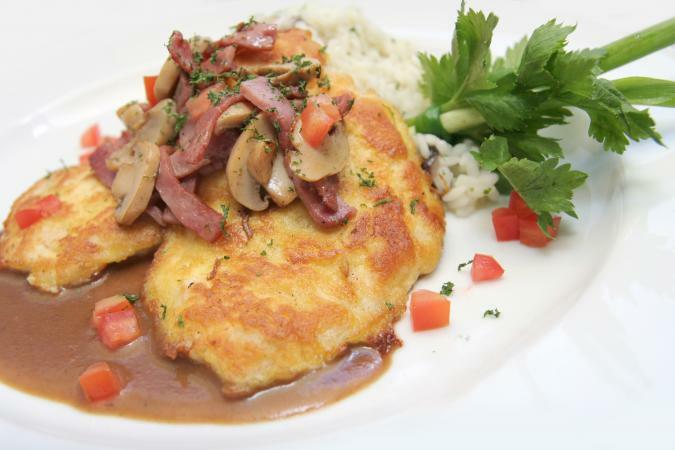 Place veal cutlets on the sauce and top each cutlet with a portion of pancetta-mushroom-tomato garnish. Add a sprig of parsley and pass remaining lemon-caper sauce at the table. Serve with risotto, Italian bread and a crisp white wine like Pinot Grigio to cut through the buttery sauce. 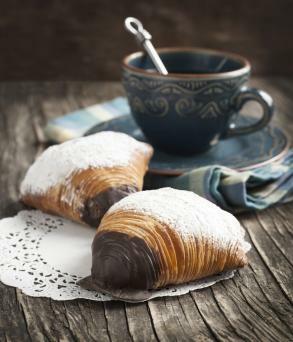 Sfogliatelle in Italian means "many leaves" or "many layers" and looks like golden seashells when baked. They alternatively are known as "lobster tails." Making the pastry dough from scratch with a pasta roller can be a little time-consuming so using purchased puff pastry is a good substitute. In a medium saucepan, combine milk and sugar and bring to a boil over medium heat, stirring constantly. Lower heat and slowly add the semolina, whisking constantly to avoid any lumps. Cook, stirring constantly with a wooden spoon for about 2 minutes or until the mixture is smooth and thick. Remove from heat. Spread the mixture onto a rimmed parchment-lined baking sheet and let cool. The shallower the pan, the more quickly it will cool. Break the cooled semolina into pieces and place in a stand mixer or food processor along with ricotta cheese, egg yolks, vanilla, and cinnamon. Process until very smooth and creamy. Add the orange peel and zest, mixing until well blended. Transfer filling to a bowl, cover the top with plastic wrap, making sure it is in contact with the surface to prevent a skin from forming. Refrigerate until ready to use. Place rack in the middle of oven and heat to 400 degrees F. Line two sheet pans with parchment paper. Remove the thawed puff pastry from the refrigerator and place it on a lightly floured cutting board, unfolding it as necessary. Roll to a 1/4-inch thickness and cut into 2-inch circles. Cover dough with plastic wrap so it doesn't dry out. Fill a pastry bag fitted with a 3/4-inch opening (or a plastic bag with the corner snipped off) with the filling and set aside. Take one circle of dough and push out from the center with the heel of your hand, rotate and repeat three more times. Pick up the stretched round and form it into a cone shape with a hollow middle. Squeeze some of the filling into the hollow so it is full. The filling is thick enough so it won't ooze out during baking, but try to pinch the end lightly to seal anyway. Place each pastry on the parchment-lined baking sheet, spacing 2 inches apart, and refrigerate while you work with the remaining dough circles and filling. Remove from refrigerator and brush lightly with melted butter. Bake 20 to 25 minutes or until golden brown and puffed up. Remove from oven and from pan and cool on a wire rack. If desired, dip one end of the pastry into melted chocolate or dust with confectioners' sugar. Serve warm or at room-temperature with port, Champagne, or another sparkling wine. Italians don't drink coffee with dessert. One of these dishes might make your mouth water, too. Pasta puttanesca: Puttanesca is a sauce that uses olives, anchovy fillets and capers to create a rich flavor to enrobe the pasta of your choice. Best of all, it's economical to make, but it tastes like a million bucks. Osso Buco: Braised veal shanks actually began as a peasant dish, but today this dish simmered with white wine, stock and vegetables is served at five-star restaurants. Lobster risotto: This seafood risotto can be made with the shellfish of your choice - but how can you go wrong with lobster? One of the secrets to risotto success is to use arborio rice. Cannoli: This traditional Sicilian dessert is made with a crisp pastry tube that is filled with a ricotta cream mixture. You can make the tubes from scratch or purchase them ready to fill. Ricotta cheesecake: There's no cream cheese in this Italian-style cheesecake that starts with an almond crust and a ricotta filling and is fleshed out with heavy cream, orange zest, and chopped candied orange peel. Panna cotta: This creamy make-ahead dessert means "cooked cream" in Italian. It consists of gelatin, heavy cream, and sugar, and is poured into a mold and chilled until ready to serve. What makes this classic so special is the seasonal fresh fruit in syrup it is topped with. Bring out the Chianti, put Mambo Italiano on the boombox and mangia bene. But, remember to do it the Italian way. Serve the salad after dinner. Then it's time for a tazzina di caffee with a shot of Sambuca and maybe a game of bocce balls or something a little more romantic!